The current Wireless Adapter's online setup and installation guide can be viewed here. The current PDF version of the Wireless Adapter's user guide can be viewed here. CyberpowerPC's Video Installation Guide can be viewed here. The troubleshooting FAQs for the Wireless adapter can be found here. Feel free to use this thread to raise any general questions about the adapter, its setup, and general use. Note regarding external enclosures: We are working closely with Intel evaluate options for supporting external PCIE enclosures so that Vive Wireless Adapter could function with laptops. We will share more details when they are available. I just spend about 2 hours chatting with support trying to get a "Headset not detected" error fixed on my machine. Sadly, it did not work for me - I'm waiting on a replacement now - but here's a list of things they tried. Hopefully, one of these might work for you - at a minimum, you'll be able to link to this post and say "I already tried everything here" when you start the chat. Between each of these steps, restart both the VIVE Wireless software and the SteamVR software. In the settings of the VIVE Wireless software, there is an option for "Pair new headset". If you pair an already paired headset again, this will re-pair the headset. Unplug your headset from the wireless adapter, and plug it into the old link box. Verify that SteamVR recognizes the headset. Once it does, reconnect the wireless box, and verify you get the same error message. * If it doesn't, this is either an issue with your VR setup, or with the short cable you were provided - try swapping the short cable for the longer one and see if that helps. 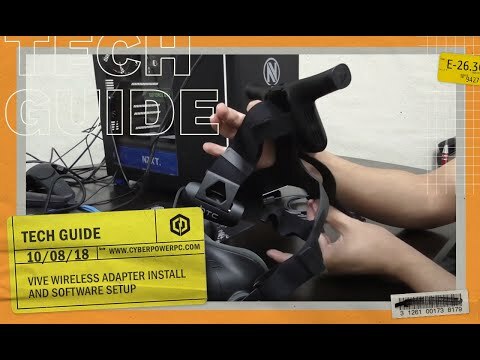 If it does, you've got a faulty cable; if not, fix your setup so that it works without the wireless adapter, then come back to this guide and see if the wireless is now "magically" fixed as well. Check every connection in the headset. Unplug it, and plug it back in. Ensure your internal PCIe card is installed in a x1 slot. If it's in an x4 slot, it may not work correctly - try moving it if at all possible, or even moving it to a different x1 slot if you have multiple spare ones. Ensure the Wireless Link Box cable is securely connected and screwed all the way into the PCIe card. Update your graphics drivers, and reboot your machine. Unplug your WIRED Link Box from your PC, uninstall all the USB drivers in the Developer section of SteamVR, reboot your machine, then reconnect the WIRED Link box, which will cause a driver reinstallation. Connect your headset to the wired link box again, as this may cause more USB drivers to install; once it's done, disconnect it from the wired box, and connect it to the wireless adapter again. If you've gotten this far and haven't had any luck, contact support, your probably have a DOA unit. Good luck to all you folks - may you have better luck than I did! I also returning the device tomorrow, I can't make it see each other Wireless-software and SteamVR. I did everything, but no luck. Also link to FAQ in the first post goes to 404 page. Thank you. I’m having a very similar issue as you. Everything detects properly and I start a game (BeatSaber) and about half way through a song my screen goes gray. When I take off my headset, the steamvr states that everything is missing (lighthouses, controllers) except the headset but the vive wireless software shows that the headset is paired. I have to close everything down and try again. But still the same issue. I’m kind of at the point where I might reimage the machine. I also noticed a slight ghosting effect while in game. @MajorJebus, can you please provide your rough system specs? Is this limited to Beat Saber or does the issue occur in other apps? I'm running into the exact same issue as MajorJebus. It happens a few minutes after starting any game. I tried several things including removing the USB drivers and resintalling the components, switching the PCIe card from a 1x to an 8x slot, and switching between SteamVR Beta and non-Beta. Unplugging and replugging the USB cable between the battery to the wireless adapter on the headset brings the headset back online. I received and installed mine yesterday. The first step that is missing in the instructions is to plug in and start charging the battery pack (even if it shows multiple lights). PCIe install went fine into small slot. The app kept showing the HMD but would then say unable to connect. This continued until I physically unplugged the HDMI cable of the old linkbox from the video card and disabled bluetooth updates to the base stations in Steam VR. I then rebooted. I was able to get the HMD to connect with 4 bars, so I started Steam VR and then started playing the Lab. As long as I was standing perfectly still everything worked fine and wirelessly. Quick head movements cause pixelization until I stop moving. This is the first time I ever got motion sick playing VR. In the middle of a game the HMD went black so I stopped playing. T he battery showed as empty so I set it to recharge and came back to it a few hours later. When I came back and plugged the charged battery in everything started up fine (app, then Steam VR, then Beat Saber). In game I didn't notice the pixelization as much and the game was totally playable via wireless EXCEPT that when I ducked or move around a wall I would periodically have the HMD go totally black. It would come back on after a few seconds. I tried jiggling the USB power cable between the battery and HMD and finally got to a point where it quit blacking out regularly. Two or three times after it went black the HMD would come back on but only be working on one eye (the right). The left eye would remain off, so I would unplug the USB cable and restart the app, steam VR, and the game. I noticed in the last crash that my Steam VR app was showing a ton of dropped frames despite the fact that I was standing 3 feet away in direct line of the antennae. I'm running a GTX 970, not sure if it just can't handle it but I don't think that would affect dropped frames would it? Hope some of this helps somone else. The first HMD connectivity issue you saw is actually the proper behavior. The adapter is designed to enable quick-swapping to corded HMDs without having to uninstall the PCI-E card. By having that HDMI cable plugged in, you were inadvertently telling the system to look for a wired HMD. The initial black outs sound like it was indeed a power connectivity issue likely exacerbated by Beat Saber's movement heavy gameplay. The second type of black out is concerning but is hard to isolate due to your system specs. The dropped frames and stuttering are almost certainly related, at least in-part, to your system specs. The wireless adapter's minimum requirements are in part: i5-4590/AMD FX™ 8350 & 1060/RX 480. Unfortunately your system is below the minimum requirements - It's actually hard to predict how being underpowered will play out on each hardware combination except behaviors like dropped frames and stuttering which are almost guaranteed. If you met the system requirements and were still having issues, that would be another story but it's impossible to tie this to another potential source since you're under spec to begin with. You didn't mention your CPU - you could be potentially be out of spec was well on this which can contribute to a great deal of the issues you described. You might want to update the install docs, there is no mention of removing/unplugging/uninstalling the original linkbox. Regarding the blackouts, if it were the power connection jiggling would the HMD come back suddenly? I assume if it truly lost power it would have to reboot and the app and/or Steam VR would error out saying there was no headset. I'm leaning toward there were just too many dropped frames to display anything. I've noticed that the pass-through camera appears to be causing a crash with the wireless adapter. With the pass-through camera enabled, my HMD will lose connection after a few minutes, and I will be given the "Headset not detected" error message along with full signal bars. The only solution is to close and re-open the VIVE Wireless software. This, of course, results in the pass-through camera no longer working (Because the HMD was re-connected after SteamVR was started, and the pass-through camera has never worked after this happens, even on wired.) Once restarting the VIVE Wireless program, the connection is reliable with no pass-through camera. Disabling the pass-through camera in SteamVR settings appears to resolve the issue as well. This is far from ideal, and one of the best parts of VIVE is the pass through camera. I am experiencing the same issue as others. The vive wireless tool can see my headset, but steam VR cannot. I have tried all of the steps mentioned here. I found that disabling the camera resolves the issue for me as well. Is it possible that the firmware did not update right?